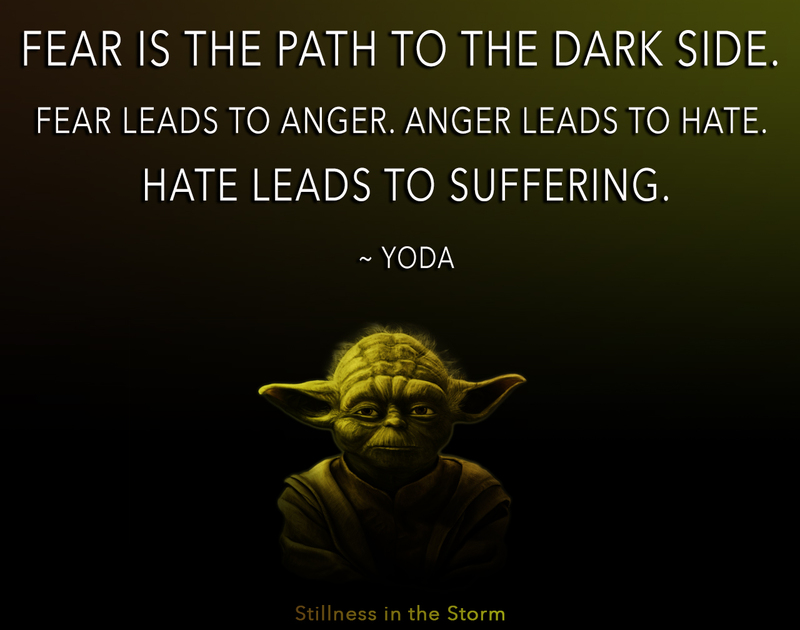 (Stillness in the Storm Editor) There is much I could say about the power of forgiveness. From a lawful perspective, forgiveness is what is needed to restore trust, the basis that forms a co-creative contract wherein two or more free-will beings form a bond of fellowship that allows their unique essence to give life to a joint venture. Everything in our reality is the product of such co-creative principles—there is nothing that is not. But when we break the bonds of trust, usually through fear or selfish pursuits, discord or disharmony exists that can only be resolved through an act of forgiveness. But forgiveness is not just speaking the words "I forgive;" it is a reconciliatory type of "white magic," a holistic act that dissolves the illusory perception and chains of separation. The shared illusion that we are “separate” is what enables brother to wage war against brother. To forgive properly is to employ the whole of our beingness, the totality of the mind, body, and spirit that "stops the wheel of karma." 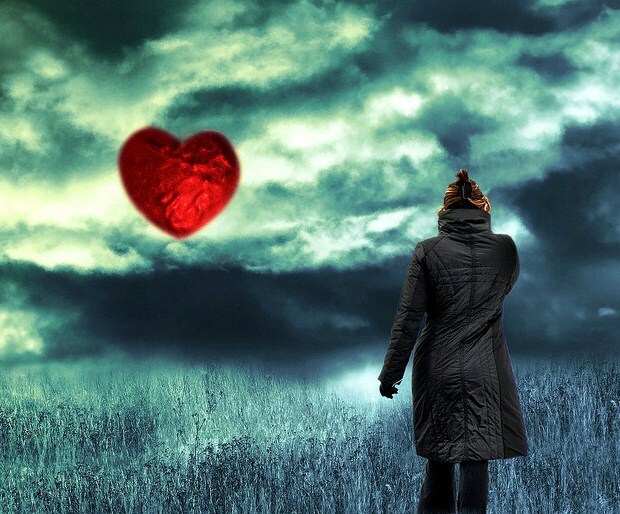 It is a heart-centered and mind-active invocation that empowers the individual to let go of the trauma of the past, paving the way for unimagined cooperation in the future. Our bodies are a community of over 30 trillion cells, each working in a sublime harmony of co-creative action. The Earth itself is a living being that is also evolving, with humanity acting as a consciousness focal point and individual human beings acting as monads—the brain cells of Gaia-Sophia. When we, in our lives, experience trauma—in any form—separation consciousness festers like cancer, causing disease, pain, and suffering for the individual, and war, plagues, and chaos for society and the planet. If humanity is the brain of Gaia, then when we hate our fellows, when we harbor feelings of fear and let oppression and indifference flourish, we limit ourselves and the potential of the Earth. The below article also discusses this concept of cooperation, which for human beings is a dynamic of social coherence. Thus to forgive is to restore the metaphysical rivers of consciousness that flow through each of us, reviving balance, harmony, and health for all at a primal level of spiritual beingness. As an example of this, consider an excerpt from the following excellent article about the Ho’oponopono practice. While Dr. Hew Len worked there, he never met with a single prisoner. Instead, he spent his days in his office reading their case reports several times daily. With each prisoner’s report, he looked inward, and asked himself what darkness, negativity, power and hatefulness could possibly be within him that it too could be in another, and thus exist in his world. When he found something within himself, he did a Ho’oponopono. Dr. Hew Len's personal method is one of internal reconciliation and healing—what Carl Jung called shadow work. Reality is symbolic by nature, in that, our subjective personal experience is fueled by awareness of the objective external world. He used the experiences of others to draw forth hidden imbalances and blockages within himself and wielded the power of love and forgiveness to heal them. Therefore, that which we fear or turn away from does not truly disappear, it putrefies within us forming the foundation of physical, emotional, mental, and social disease. If fear is rejection and turning away from something, then love is the reverse—love is acceptance but not complacency. Love restores harmony by taking that which we have tried to hide from ourselves and brings it back into focus. Then through forgiveness—a releasing of fear and trauma—the chords of metaphysical energy—so to speak—that formed this web of separation are dissolved, and the influxing energy of awareness can properly flow through the body. 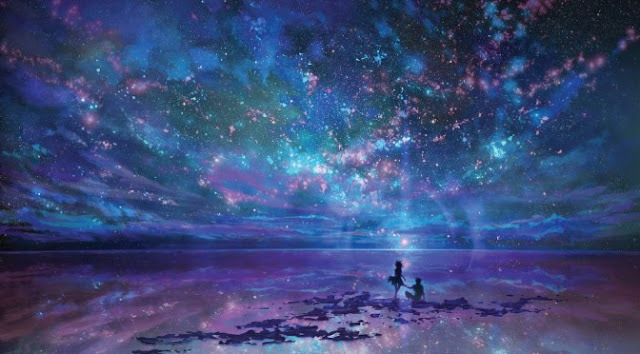 In this sense, unselfish or unconditional love is an internal state of being that is a receptiveness to the truth, a preparation for receiving full disclosure of reality as a whole. While forgiveness can be directed at someone in a social fashion it can also be used as a tool for inner reconciliation and healing. Dr. Hew Len didn't need to direct his healing statements towards the prisoners directly in order to benefit from the effects of saying the words. In this way, the words are more like a talisman or incantation, a kind of ritual that affects his consciousness, and by extension, affects others. This principle of reconciliation for inner and outer healing is of key importance in these times of transition and evolution. Humanity is at the precipice of great changes that are intimately connected to the future we are creating for ourselves by our choices at this time. Separation consciousness, marked by fear, trauma, harm, pain, suffering, intolerance, hatred, and so on, is a kind of soul sickness that plagues the individual and the human race as a whole. Only through the reconciliatory power of forgiveness—a personal act of will that each individual proactively takes part in—can the mind virus of separation be cured. Therefore, do not let fear guide your actions. Do not let hate and intolerance fester within you. When presented with a situation that you have labeled as fearful, find the courage to forgive yourself and let the healing waters of reconciliation wash over. As a final note about forgiveness and unselfish love, remember that love is acceptance, most importantly of the whole truth. But forgiveness and love is not complacency in the face of harmful actions towards others. By this I mean, we can invoke a consciousness of forgiveness and love without also being passive when witnessing harm. The man who seeks to kidnap a child should be stopped from doing so but at the same time, we mustn't also bear hatred and withdraw our love in the process. In addition, do not succumb to the path of fear—as so many often do, sometimes convincing themselves it is for a greater good. When we reject reality because we don't like what something is or means to us—no matter what form it takes—we are acting out of fear. Find the power to love unselfishly, to accept reality (truth) in all of its wholeness, so that fear does not become hatred, and hatred does not lead to suffering. For example, when we see things in our reality that do not resonate—like pedophilia, crime, violence, intolerance, environmental destruction, and so on—find within yourself the courage to accept (love) these things for what they are—as in face the truth no matter how horrible it might be. Do not ignore it. In acceptance of the truth you empower your consciousness to take actions to stop harm that would otherwise continue on. In short, we can and should stop evil and harm without also letting hatred and fear motivate our actions. When Gandhi was assassinated, the last thing he did was bless his attacker before falling to the ground in death. The story of Jesus crucifixion—whether real or not—is the same. He forgave his attackers in the last moments of his life—despite having every justification to hate them and seek vengeance. But the price of invoking hatred and fear, the path of the dark side as Yoda put it, is the sickening of the soul—no matter how seemingly justified we might feel. In this sense, the path of the razor's edge is to love thy enemies—in all their forms—while also seeking to restore harmony and balance in the world—this is what true forgiveness is all about. We need not hate our enemies to defeat them because the source of all evil is false or incomplete ideas given life by people—the people themselves are only agents of darkness, not the darkness itself. 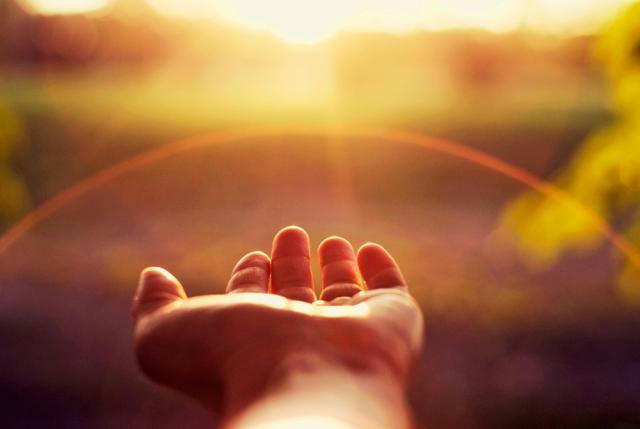 And in almost every moment of life's journey, there are opportunities to let our inner darkness rise to the surface, so that—like Dr. Hew Len—we actually seek out our shadow so that the healing power of forgiveness can transmute the darkness into light. The Secret of Secrets from the Emerald Tablets of Thoth refers to this amazing power of transmutation, and that this is what our purpose here actually is. As was just discussed, the way to effect this cosmic transmutation is through reconciliation, healing, the restoration of trust, and the co-creative power and magic of forgiveness. First I shall speak of the fetters of darkness which bind ye in chains to the sphere of the Earth. Darkness and light are both of one nature, different only in seeming, for each arose from the source of all. Darkness is disorder. Light is Order. 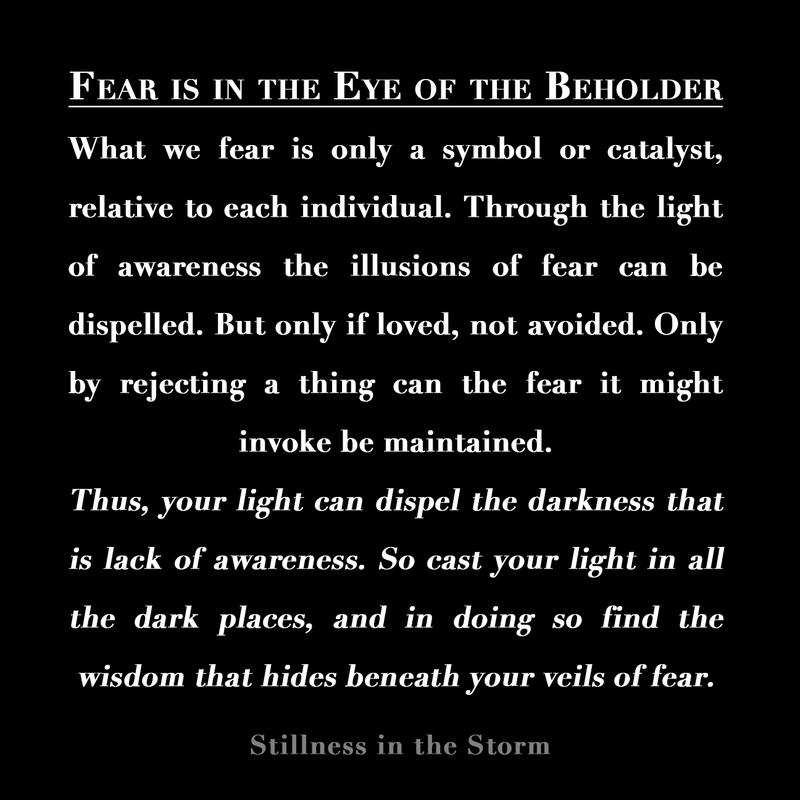 Darkness transmuted is light of the Light. 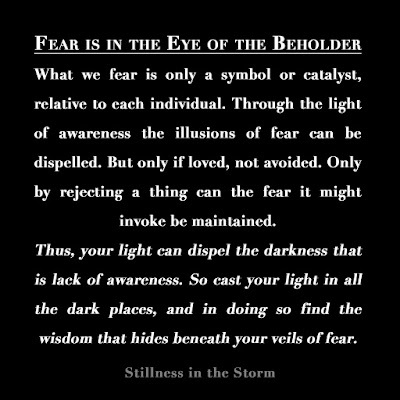 This, my children, your purpose in being; transmutation of darkness to light. ~ Thoth, The Emerald Tablets. P.S. A reader sent me an email with some concern that the following statement (quoted from the above introduction) implies that I am suggesting people should develop an "an intense feeling of deep affection" for the horrors of this world, such as pedophilia. But this wasn't my intention and I want to take a moment to clarify things. For example, when we see things in our reality that do not resonate—like pedophilia, crime, violence, intolerance, environmental destruction, and so on—find within yourself the courage to accept (love) these things for what they are—as in face the truth no matter how horrible it might be. What I was attempting to express (and seemed to have failed to do in some respects) is that love can be defined as acceptance when juxtaposed against the concept of fear, meaning, that love and fear are two polarizations of consciousness. Love in most respects describes an orientation of receptivity, whereas fear is an orientation of rejection. When we love something, we are open to it—which can sometimes mean desiring it, but also simply mean we acknowledge it's existence. It is this latter meaning I was attempting to speak to in the preceding statement. I responded to the reader with the following that might help clarify any other confusion with my commentary. I think love is a word that is used in so many different contexts it has largely been bastardized. I don't expect people to do anything, I am merely suggesting that they find the courage to accept the whole truth, that these things exist, which is different than actively seeking to enable and perpetuate them. Many people turn away from the truth, and in my research and understanding that's the basis of trauma. When we turn away from reality because it is too intense for us to personally process, trauma is born. I think we have to expand our definition of love to be less black and white and duplicitous, that's at the heart of what I was getting at with that definition and statement about "loving" pedophilia. It's a technique that will seem strange and foreign to one who may not understand what unselfish and unconditional love is. Which is that, love is acceptance, receptivity, openness—in this sense, to the truth. So taken out of context, your right the statement seems strange. But I think within the context of the whole introduction, it has been defined in a way that means acceptance. Think of it like this. you may not like your addiction to something, but until you learn to acknowledge it, you can't be empowered to change it. And a large number of the things in this world that are horrific and harmful, like pedophilia are so horrible people just ignore them for their own self preservation (emotionally), which of course enables these things to flourish. When good people do nothing, evil takes root—this is another way to look at it. Anyone who might have additional concerns or commentary I encourage you to share them with me. I do my best to articulate concepts that are sometimes so foreign to how we normally think, things can get lost in translation. And I rely on the feedback of others to improve my process of articulation. Much love and my thanks. We live in a world that is guided by the universal law of cause and effect. What we as individuals, groups of people, communities, societies and countries put out into the world through our thoughts, manifests. What we put into our collective consciousness has an effect. The cause being the thought. Everything is energy. All things have an energetic effect. We are all responsible for the shape of our lives and our world. We are all connected and bound together through this principle. 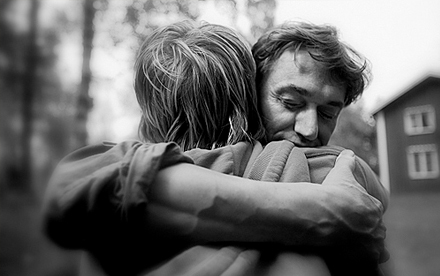 When we hurt one another, whether intentionally or not, it is truly important for us to find forgiveness and healing. This is Ho’oponopono. These four sentences. It is a healing tool we can utilize for forgiveness. At this time, we may offer it to our newly elected world leaders, friends, family or a situation such as the turbulent US presidential election. For those of us unfamiliar with Ho’oponopono, these four sentences offered to both Hillary Clinton and Donald Trump, as an example, may feel like an instant trigger of built up internal emotions as many people have been going through anger, fear, hurt, confusion, and sadness both during and after this election. This healing modality can help take us from those feelings to feelings of deep forgiveness, acceptance, love and peace. If there is a need to heal hurtful differences you have had with others around the issue of this election, then you are in the right place right now by reading this piece. 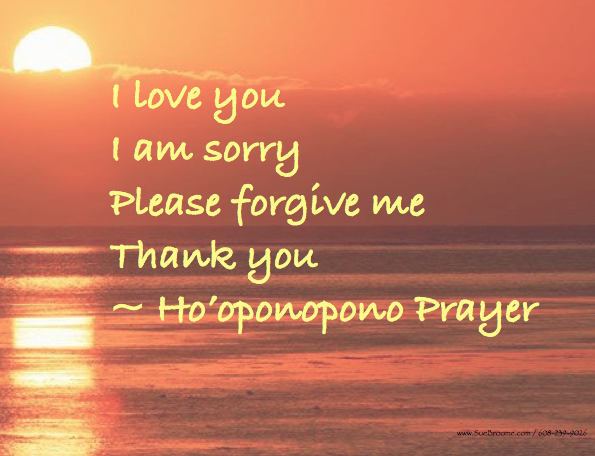 Ho’oponopono is the Hawaiian ritual of forgiveness, and it belongs to an ancient system of teachings called Huna (Hu=Knowledge, na=represents Wisdom). The Hawaiian islands also go by ‘The Land of Aloha’, the land of love. It is in this essence and spirit of Aloha that we find Ho’oponopono. We all share a common path. Along that path, there is only one great universal power that accompanies us, and that is the power of unconditional love. It is the essence of God, and the place where compassion and unity spring forth. Ho’oponopono also means “compassion in action”. It helps us move past the duality behind good and evil, which is where we become separate from one another through judgment and condemnation. Through 4 simple sentences, Ho’oponopono can bring us to inner peace, harmony and unity. It offers us a solution to solving a problem while returning us to our divine plan. I’m sorry (add the person’s name). We come to a stillness, and connect within our being. We contemplate, recognize and accept the problem, and ask for support through courage and peace. Please forgive me. We view the problem and all of its nuances, and we go within our own heart to seek out any part we may share in the problem. We take on 100% responsibility for the existence of the problem within us, another and our world. (100% responsibility=100% power). This could, for example, be in the form of a past experience where we have been hurt, and we are thus intensifying the current situation with the past. Perhaps we ourselves have made a judgement that has contributed to the conflict. These are all examples of things that require healing from within. I love you. Forgiveness takes place unconditionally, and we pardon ourselves and others. Thank you. With these words we express our faith and trust, and we let go. A prayer of gratitude may be offered to end. It has been through Dr. Ihaleakala Hew Len, who took over the leadership of the Foundation of I Institute, that Ho’oponopono became known throughout the world. He spent 4 years working in the psychiatric department of the state prison in Hawaii, which had conditions described as “the hell”. Thirty prisoners were confined there. There was a chronic shortage of security and staff. Many employees put in their notice as soon as possible after beginning employment, and even handcuffed prisoners were known to inflict violence upon staff. After 1.5 years, the atmosphere and mood of the prison hospital had completely altered. After 18 months, none of the prisoners needed to wear handcuffs, and they walked freely. People came happily to work, and the illnesses declined. Therapeutic conversations could then be held with the inmates, and after 4 years all of the inmates, except for 2, were completely cured. The institution closed. How was this possible? Through Ho’oponopono, Dr. Hew Len worked to continually cleanse his own heart, and take 100% responsibility for the existence of the prisoners in his life. This study has been well documented, and Ho’oponopono is now an acknowledged therapy in the USA. There are also more than 50 studies for forgiveness at the diplomatic level. Please, take the time to say it aloud. Some people have reported that it has had a miraculous effect when they even whispered it. Looking into your own eyes in a mirror while saying those 4 healing sentences can also be quite a testament to it’s extraordinary effect. If we all practice Ho’oponopono, look within, forgive, heal and love, then perhaps we can begin to see a shift in our lives as well as in our governments. Through cleansing what we have witnessed during this election season, there is hope for a deep shift within and without. It’s time to love ourselves and each other more. We all need more love. Let’s open ourselves to Ho’oponopono as a way to heal our inner and outer world. Deepest love and appreciation to Ulrich E. Dupree for writing the book, ” Ho’oponopono: The Hawaiian Forgiveness Ritual As The Key To Your Life’s Fulfillment”. This little book has been with me for 2 years now. Thus, a lot of the information I have shared in this article has come from it. I am grateful for the balance, peace and healing that it continues to bring into my life. This is the website of Dr. Ihaleakalal Hew Len. To read testimonials of peoples’ experiences during and after Ho’oponopono, click here. Finally, Aloha International has a wonderful list of books and resources (some free) to help understand more about the Huna healing art of Hawaii and Hawaiian Shamanism. If you have other resources or references that may help people heal through Ho’oponopono and Huna, please leave a link in the comment section for us to all access and, thus, from which we can continue to heal and grow. Peace begins with me. I am a part of the Universe. When I change, the world changes too. Peace begins with each and every one of us. Aloha, ‘I see the divine in you, and I see the divine in myself.’ May we all find the healing we need, and may we all treat ourselves and others with respect, dignity, compassion, acceptance and love. 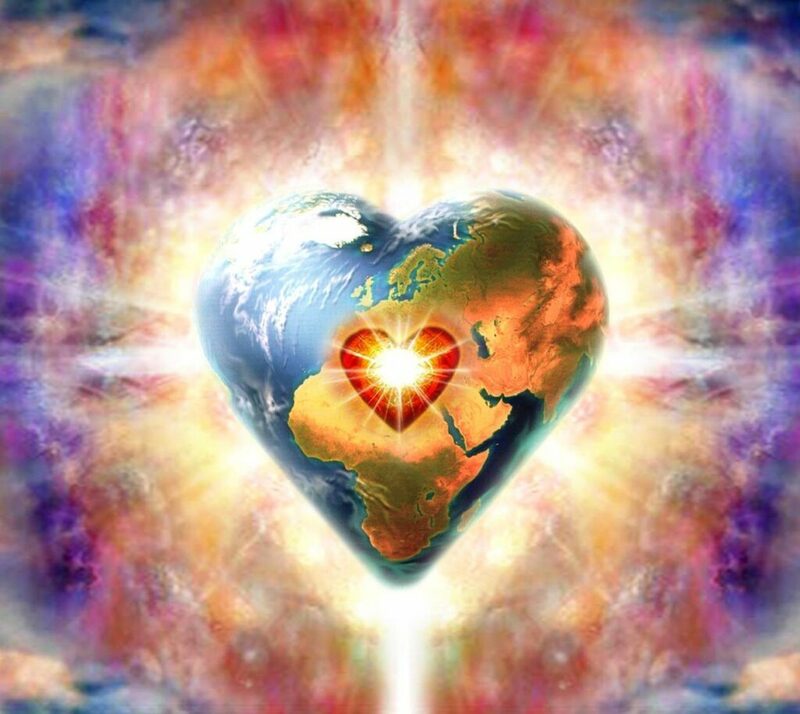 When we heal ourselves, we heal the world. Peace be with me, and peace be with you. Ulonda Faye is a certified wellness practitioner, holistic esthetician, and Rejuv Miracles Practitioner. Based in Santa Fe, New Mexico, she offers online and in-person education in holistic skincare, self-love, beauty rituals, and life coaching.